So happy to hear you have joy again. Blessings and love for a sweet Summer and a peaceful start on your new path. Go gently, be soft lovely Stephanie. Dear Stephanie So very glad to hear you are smiling again! Beautiful,beautiful photographs of your girls! Lovely to hear a happier and more positive note in your post. lovely to read about your new life journey…. all the best and a lot of happiness to come! I sense a contentment from your words Stephanie which is so good! You will be fine...just look at those gorgoeus girls, how could you not be! Though I had declared I'd be gone from posting, I have decided to come back but on a monthly basis because having connected with a world of like minds and also with myself, I can't stay away. This is why we blog, create, reach out: EACH OTHER. I am so relieved to learn that you are finding peace in the middle of a situation that unraveled with almost no warning. You have done all you could to find what is yours: YOUR PEACE of mind, your childrens' love and laughter. The girls look marvelous! And your blues and creams, mauves and natural settings chère Stephanie, are a welcome to me on this lovely Sunday morning. I am so happy to see you here. I know that goodness will follow you all the days of your life. I just know it. Such lovely images (words and pictures) of your two girls and your daily life. I'm so pleased things are moving on for you in a better way. Wishing you a summer of blessings amidst everything. Your daughters are beautiful in their new smocks and smiles that express their happiness. so tickled to find your post this morning.....and such a lovely one it is!!! And so good to see you have been so creatively busy.....those tunics (and your girls!!!) are beautiful; the tunics obviously loved and appreciated! I've been gifted a couple copies of Selvedge and really do need to simply subscribe....one of the best publications I've ever seen!! You showed just enough to grab me (again!). So happy you are happily back in your space. You've been missed. Good morning Stephanie and thank you for sharing all this blue-themed soft beauty with us. Your descriptive words and excellent photographs really convey an atmosphere of generous love and creativity flourishing amongst you and your children. This is a strong and supple fabric to take you all into the future. I am another Selvedge fan and particularly like this current issue with its "aging" theme. There is always something in each issue that seems to call out to me. It's a unique publication. 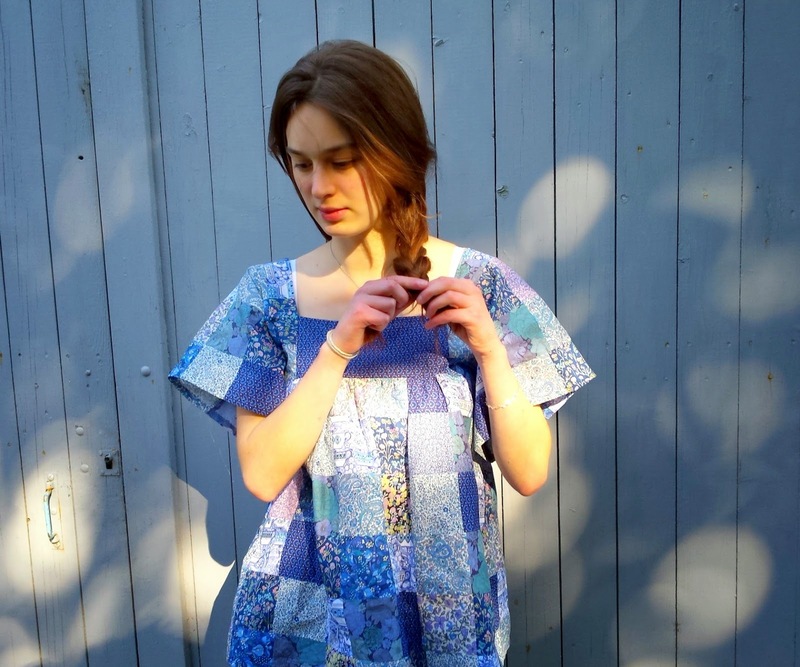 Those two patchworked tunics look marvelous on your daughters. Each colorway gives each girl an individual take on the silhouette. Yes, that Liberty tea party fabric is amazing...no wonder it is sold out now! I know of The Miniaturist, but have not read it. There are many books stacked nearby waiting to be read, but I will also look for this one at the library. Fresh local strawberries are just beginning to appear in our farmers markets. I want to follow your lead with a new way to serve them. Thank you for that idea. Dear sweet Stephanie, I am so happy to read that there is peace and laughter in your life once more. I hope all goes well for the future and all of the uncertainty for your finances will be gone. Beautiful shifts you have made for your daughters, the fabrics are lovely. Sending you lots of good wishes and love. So glad to hear that things are coming back into focus. 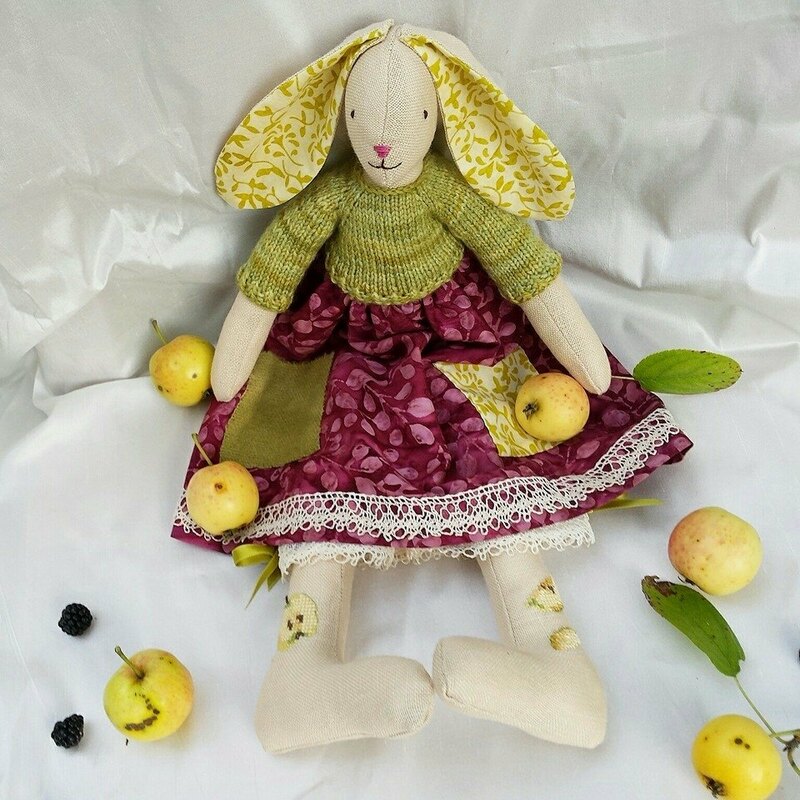 Adorable makes as always and I'm a little envious of the Selvedge subscription - it is on my wish list for next Christmas! I've been thinking of you lately, and worrying of course. I'm happy to read your words here today (I hope the financial issues will be solved very soon so that you can relax about it). It is a pleasure to see your two daughters smiling together. They're so beautiful. And no need to say I'm in love with their tunics. These lights and colours are so typical of this period of the year for me. We've just had bluebells and forget-me-not in the garden. SO glad to hear that your blues are happy ones! My word, that little Angélique is growing up quickly. I hope that the financial worries will smooth themselves out and that the peace of your home will only increase. Selvedge is a truly gorgeous magazine - enjoy that subscription! I am glad your post emits happiness and more peaceful days. Your girls are gorgeous! Love them in these sweet tunics. Good to hear you sounding more positive Stephanie. I've had Selvedge since the first copy and love the style of the whole magazine. I enjoyed The Miniaturist although never really understood the role that the miniaturist played in the overall story. I am glad your husband has gone and left you a more peaceful home. Lots of men having those mid life crisis's it seems. Well, I am afraid they ultimately lose out. I have been on my own since my daughter was 3 and is now on her late twenties. Give or take a romance here or there. It has left me space to take the best care of my daughter and now myself. To do the things I like and to look out for and be responsible for my own piece of mind. To chart my own waters so to speak. I am most unlikely to remarry. All the single unmarried women I know (most of whom never have) are balanced and happy and fulfilled. You will be fine whatever happens in the next turning of your life's journey. Just remember to look out for yourself and to think of your own needs and be proud of your lovely children. Depression is an illness for sure, but it can be a very selfish one and there is no reason why you should be sucked under too. The person has to be responsible for their own recovery. I am so glad to read you see blue skies and your days are once more filled with happiness, despite your sadness. You are a very strong and positive woman to be the way you are with all the uncertainties ahead. Hope all will be well for you Stephanie. I think about you often. Isn't it strange how you can have a perfect life and then suddenly it all changes.....It's good that you are full of gratitude and faith. I try to be like that as well. That, your children and sweet family and friends keep you going. And one day all will be will again. I am sure of it! I'm so glad to know that you are doing well, Stephanie. The blue in your photos is beautiful, as are your lovely girls. I really like their tunics, they look great in them. Take care and be well. I hope that every day gets better and better for you. you sound in a very good place, the judge will sort everything out. Hang in there and believe!! I indeed came back, and THERE YOU WERE. Going full circle is the only way to learn what you need to be doing. The journey is always far more interesting than the destiny. Dearest friend, you mean so much to me! I also meant to add that I found the miniaturist gripping in the reading but a little disappointing in the end. The evocation of the Netherlands was marvellous but the central conceit of the miniaturist did not fully work for me. Still I am pleased to have read it and it has lingered long in the mind. I wish you nothing but the best. Things can only get better from here. Hopefully all your paperwork and legal meetings will be over and done with soon. I am so happy you are finding joy again. I like your optimistic view of "blue skies". Hopefully you will get all the legal stuff finalized and out of the way and you and your little family can move on and make your own memories. Hugs to you! I've been meaning to read The Minaturist! Is it any good? 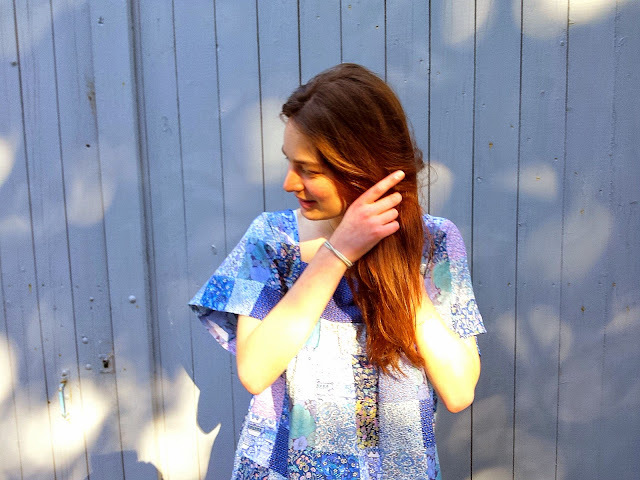 I just love your sewing and am happy to have come across your beautiful blog. I love your lovely blog.. I like your optimistic view of "blue skies". Hugs for you. Congratulations.